Later, Orson corresponded with Wilbur E. Hagans to try to take the Eggleston line back further. These letters were dated 1910 and 1911, which was late in Orson’s life. We do not have copies of the letters Orson sent. We can only assume from these replies what questions he had asked and what information he had given. It appears that Orson must have given Mr. Hagens his genealogy as he knew it: His parents Samuel and Lurania Powers Burgess; Samuel’s parents Samuel and Elizabeth Hill; and that Samuel’s parents Samuel and Rebecca. 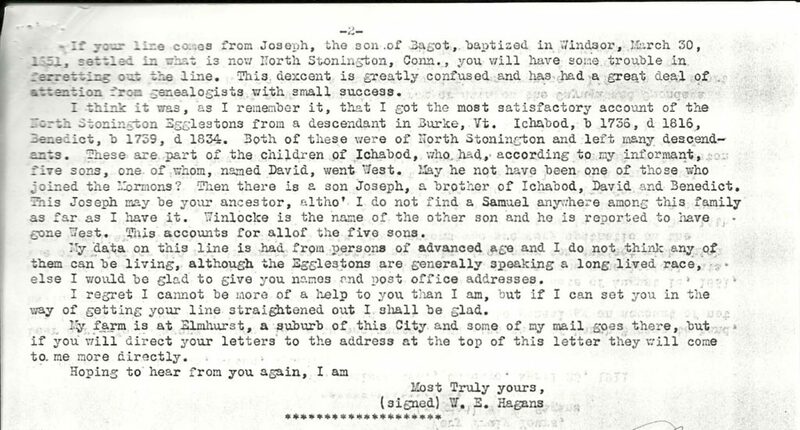 Because of the multiple Samuels, Hagens seemed inclined to place them in the family of Bygod’s son Samuel. There were a number of early Samuels, but as Hagens noted himself, there were missing generations. 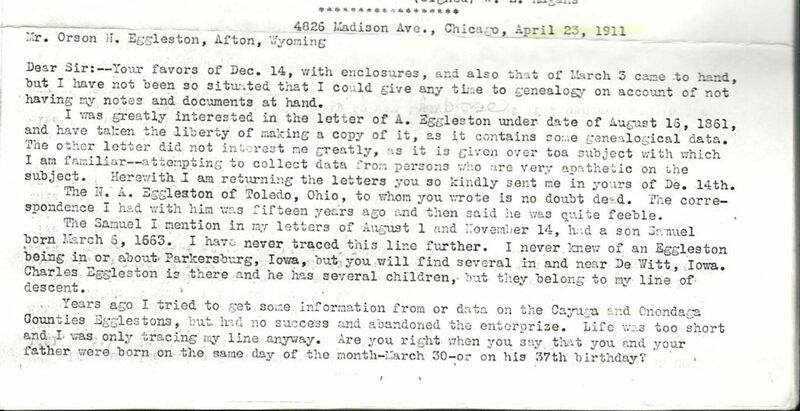 Orson may have also mentioned his father’s brother Ambrose, as it appears he assumed that might be the Ambrose Eggleston whom he knew had collected genealogical information. Samuel’s brother Ambrose had lived in Parkersburg, Iowa. He was some kind of minister, but he was not the Rev. Ambrose Eggleston that Hagens mentioned. Hagens was probably not much help to Orson, especially since he had not had any success in the area of New York where Orson’s family had lived. He suggests that our line might go through Bygod’s son Joseph – which it does – but he seems only familiar with the family of Joseph’s son Ichabod. These letters were included on the type-written sheets which I found at the home of cousin Ruth. These sheets included family genealogies and letters sent from Orson to his father and letters from other family members to Samuel. I assume that Theron Eggleston or his wife typed them up. There may have been further correspondence, but this is all we have. 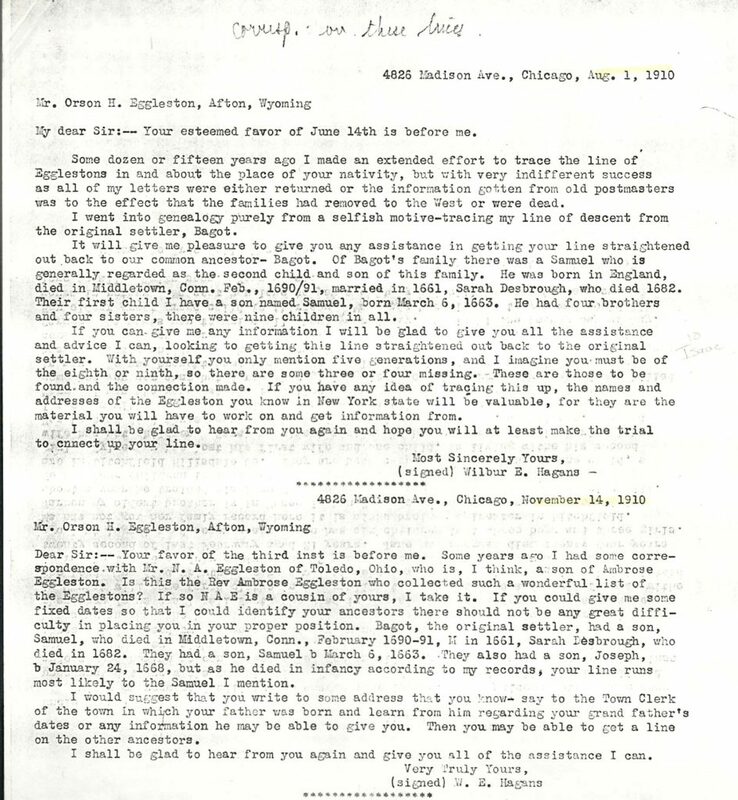 These letters did not provide any real answers or information to trace our Eggleston line back further. They did give me some insight into the desires and early efforts of Samuel and Orson to search out our ancestors. I also gained a greater appreciation for the availability of good information which make our searches today easier and more fruitful. This entry was posted in Family heirlooms, Historical Information, My Stories of Discovery and tagged Eggleston, letters, Record keeping, research. Bookmark the permalink.